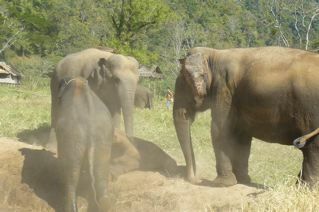 For 2 days and a night we stayed at the Elephant Nature Park. 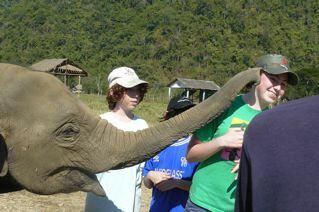 They have 32 elephants, some of whom are orphans, or handicapped. They are all domestic elephants who have been mistreated and abused. Most domestic elephants in Thailand are abused and mistreated, and often have to go through a brutal training ceremony called Pagan. They also have 42 rescued dogs, and a bunch of rescued cats, water buffalo, and cows. It was amazing if you love animals! 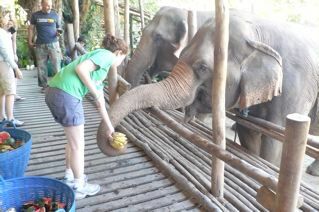 On our first day we got to feed the elephants (they each eat huge barrels of food. I think it’s 10% of their body weight each day, and they weigh a lot!). They grab the food with their trunks, and stick it into their mouths. It’s really sweet. 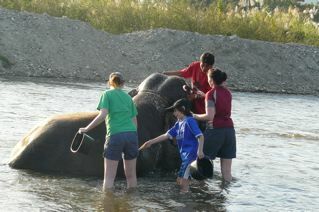 We also bathed the elephants (twice) which was fun. The elephants walk into the water, and their mahouts (trainers sort of) have to roll them over, and then you can throw water on them with buckets or brush them. The babies would roll around and jump on each other. They were adorable. After that we watched how they trained the babies. They give them treats, like training a dog. Then they kiss people. Well, they put their trunks on people. Later we bathed them again. In our free time we played with the abundance of dogs, which was nice because we haven’t been able to play with any dogs since we got to Asia because they might have rabies. They were also really sweet. When I was in our room (a thatched hut), one of the dogs just came wondering in. This happened again later. That night there was a bonfire, and we released these paper lantern like things with candles into the sky. They looked like stars. 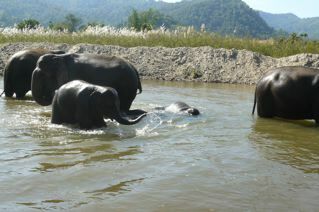 The next day we bathed the elephants again, and fed them. I fed an elephant, Jokia, who had been blinded by people. I also fed an orphaned baby named Hope. This was the best thing we’ve done on this trip so far. It was amazing, especially since I love elephants and animals so much!